The result was not surprising: 75% of the 388 respondents said ‘yes’, trust in the organisation is different from that between two people, with the other 25% ( sizeable minority) saying ‘no’. Without doubt, organisations are personified: we hold them in affection or disgust, we talk about them as individual entities, not assemblages of infrastructure and people. This is a facet of organisational culture: it’s not quantifiable in itself, you can’t pick it up and measure it, but rather you see the edges of the shadow. We can see when culture fails, and feel when it’s strong. But culture itself, a co-created fiction of everyone inside it, cannot be photographed or weighed. It can only be experienced. Trust is an interesting emotion (is it an emotion? If it’s not quantified, it it’s not a physical mass or waveform, it must be a fiction we invest, a kind of imagined currency?) in that it can be invested earned and squandered not only by people, but by inanimate objects too: i trust that my phone will store my photos, i trust my house will not fall down, i trust that water will come out of my tap when i turn it on. Indeed, i trust these things so much that i have no backup plan: if the telephone network goes down, i’m reduced to two tin cans and a length of string. So 75% of respondents feel that trust in an organisation is different from trust in people, but i wonder how they act differently as a result of that: do the people who feel it’s different act differently, or do they simply report that they feel differently. Do they have a different expectation when they turn the tap on, or simply instinctively feel that ‘trust’ in people is a different thing, even if they act no differently when the ‘thing’ is a tap? I could hypothesise that the experience of trust has changed the outlook: we know already that a majority of people have no or low trust in the organisation they work for, so they seem to be buying into at least the notion that ‘trust’ in organisations exist, so does that now leave us thinking that it’s a different type of trust, or just a different quality of trust? Maybe that’s a more fruitful angle to follow: is it just that ‘trust’ in organisations is less good than that in people? Or better? My question (at this stage) is neutral on whether trust is ‘better’ or ‘worse’ when invested in an organisation. 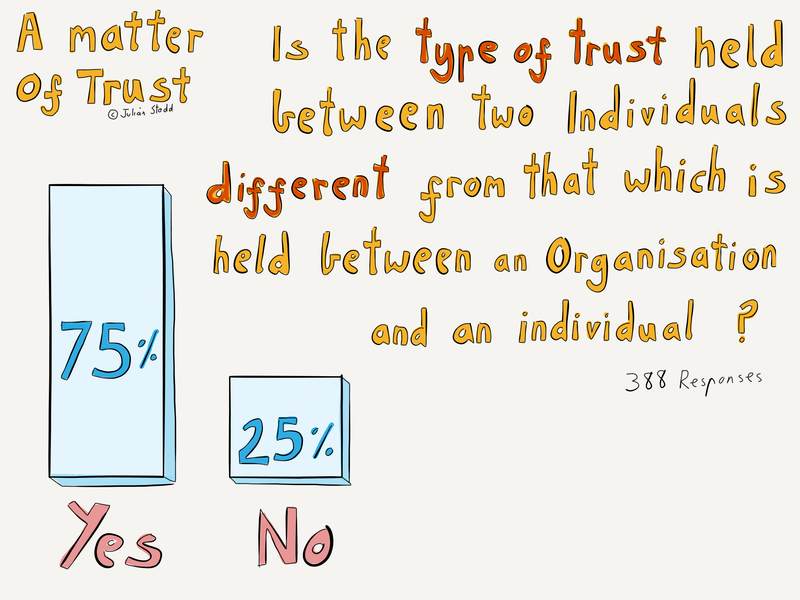 Maybe some of those 75% feel that Organisational trust is better, simpler, or simply easier to quantify? If the 75% are right, and that ‘trust’ in organisations is fundamentally a different thing from ‘trust’ between two people, the what does that mean for the 25% who simply don’t see this: are they blinded by belief, unable to see the obvious? The questions that are coming up in the next phase of the research will build out of some of these core notions: where we see strongly dominant responses, it may be that a clear consensus exists, or it may be that we are venturing into parts of the Landscape of Trust that we simply cannot see clearly, so resort to our deeply held beliefs, irrespective of the evidence. In some cases, we may be wilfully blind, because that convenience prevents us having to confront harder truths: for example, history shows us that organisations will cut people out at a moments notice. If we saw that behaviour in a friend, we would be wary, but we accept this fractured Social Contract from the organisation without a second thought. 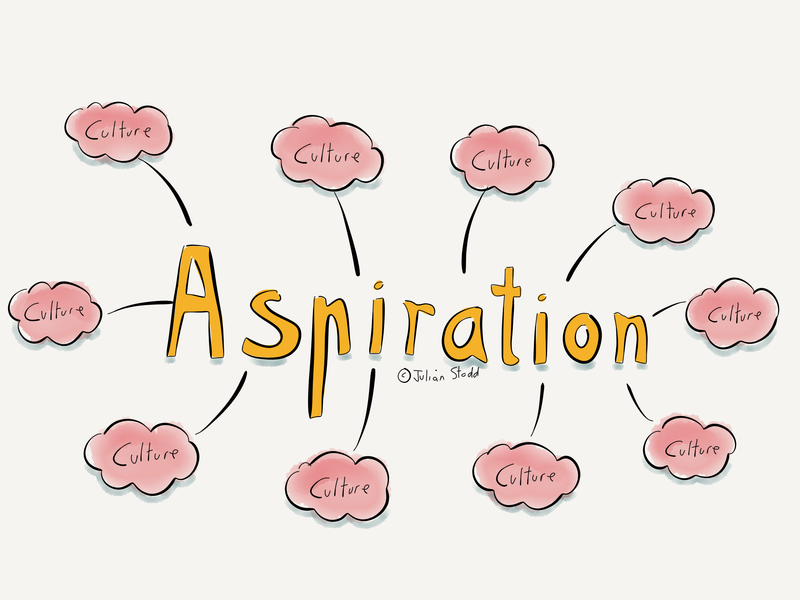 Trust is complicated: this #WorkingOutLoud post is one of a series around the Landscape of Trust that i’m writing as i work on the diagnostic tool and baseline data. This entry was posted in Trust and tagged Authority, Friendship, HR, Landscape of Trust, Leadership, Social Contract, Social Leadership, Socially Dynamic Organisation, Trust, Types of Trust. Bookmark the permalink.